Terrance Roberson sat motionless in the front seat of his friend’s black 2001 Honda Civic as fire trucks and police vehicles encircled the car, sirens blaring. Phone wires and electricity cables hissed on the roof over his head and snaked down the window on his left. To his right, in the passenger’s seat, lay the culprit: a silver, fiberglass utility pole, which had fallen over and cratered the right side of the car’s roof as it was driving by. For more than 40 minutes Roberson was frozen in place until the electric company, Eversource, arrived and cut the power, allowing firefighters to extricate him from the vehicle. “I don’t remember it too much, honestly,” the 24-year-old Roberson said about that night on Erie Street, near Four Corners, when he sustained a severe concussion and injuries to his knees, neck and back, for which he’s now seeing a chiropractor. Elias Diaz, 22, a barber at VIP Barbershop near the intersection of Washington and Erie streets, was perched on a stool outside smoking a cigarette when he noticed the cables and wires across the street sagging. Then, as the pole on the corner slowly began to keel over, Diaz ran into the shop, yelling for everyone to take cover. Fourteen-year-old Star Tejada, an employee at St. Michael’s Botanica next door to VIP, was organizing shelves in the back when she felt the quake of the fall and heard the crunch of glass. She initially thought “it was another shooting,” so she cautiously made her way onto the street, where live electrical wires rested limply across the roof of a car and spilled onto the street. For many in the neighborhood, it was déjà vu; a pole in the exact same location had toppled over on its own and slammed onto a passing car just three years before. 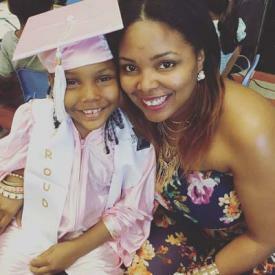 In June of 2013, Satisha Cleckley, then 25, was driving five passengers home in a rented 2013 Hyundai Sonata when the pole at the corner of Erie and Washington, then made of wood, fell, smashing into her car and trapping Cleckley’s three-year-old daughter, Ja’Niya Robinson, and 6-year-old cousin, Nyama Williams, as the downed cables crackled and spewed dancing flames around the vehicle. June 2013 crash on Erie Street: . In June 2013, Satisha Cleckley and her daughter— along with three other passengers— narrowly escaped injury when the rental car Cleckley was driving was struck by a pole as they drove by. BPD photoMere moments after Cleckley, the children, and her other passengers, Christine Clark, then 22, and Aquilla Williams, 29, made good their escape, the car caught fire. 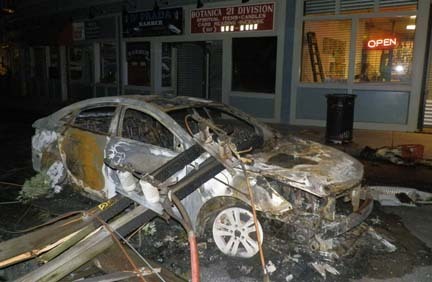 When first responders finally tamed the mini-inferno, the Hyundai’s interior had been incinerated. Three years later, Clark, Cleckley, and Ja’Niya have filed lawsuits against NStar (now Eversource) and Verizon. But they have yet to see a penny for their troubles as a dispute continues to unfold between the utility companies with each claiming the other was responsible for the pole’s maintenance in 2013. The plaintiffs’ lawyers have additionally filed suit against Verizon’s insurer, AIG. NStar spokesman Mike Durand told the Reporter in 2013 that, per the agreement, NStar was responsible for pole maintenance in Brighton, East Boston, Jamaica Plain, Roslindale, South End, and West Roxbury. Verizon had jurisdiction over poles in Charlestown, Mattapan, South Boston, Roxbury, and Dorchester, where Erie Street is located. Eversource offers a different story. Its legal team, per court documents, has alleged that Verizon removed its wires from the pole in an attempt to “abandon its responsibilities for the pole,” which “was not proper procedure.” Verizon also failed, according to Eversource, to submit paperwork to Eversource to transfer sole ownership to the energy company. Therefore, whether or not Verizon had wires on the pole is a matter of neither here nor there. Erie Street intersection: Griffin Connolly photoBefore the collapse in 2013, community activists, store owners, and neighborhood groups had expressed concern about the pole’s precarious condition to NStar, which, in turn, notified Verizon. On June 4 of that year, the two companies discussed plans to install a fiberglass replacement pole, but no support beam was planted nor extra precautionary steps taken to give the cables and overburdened pole on the corner additional support as a stopgap measure before they toppled later that month. As both companies continue to deny culpability for the 2013 incident, Cleckley continues to forfeit hours at DentaQuest, the dental insurer where she works as a customer service representative, to pursue her court case. She is non-salaried, and any time away from work represents lost income, a steep opportunity cost. For more than three weeks after the accident in 2013, Cleckley was physically unable go to work, which cost her approximately $2,244 in wages from her under $35,000 in annual income, according to a pre-trial memorandum. Still coping: Satisha Cleckley and her daughter Ja'Niya, are still struggling with the aftermath of a fiery 2013 crash on Erie Street that left them traumatized. Ja’Niya, who turned six last October, regularly visits a therapist to deal with trauma stemming from the accident. Cleckley told the Reporter that her daughter keeps a wary eye on the poles and wires from her booster seat in the back of the car, vigilant at all times for any signs of danger. “If she sees something, she screams out, ‘The pole’s leaning, don’t drive that way!’ ” said Cleckley, who is both surprised and saddened at the incident’s continuing psychological effect on her daughter. As to this year’s incident, Roberson may face a less onerous litigation process since it is clear this time around who was responsible for the fiberglass pole that nearly crushed him in his seat: Eversource. Its spokesman, Durand, has confirmed this. Roberson’s mother and lawyer declined comment for this story, citing the ongoing nature of the case. The Reporter has spoken to neighborhood activists, groups, and store employees, none of whom said they had reported problems with the fiberglass pole to Eversource or city officials. Diaz the barber said the pole at the corner never looked crooked to him, although he motioned with a lit cigarette to others down Erie Street that appear to be sitting at every angle except 90 degrees. Tejada, the botanica shop employee, speculated that commuter rail trains passing near Erie Street had a destabilizing impact on the pole. But, she stressed, she didn’t see or hear a train directly before the crash in July. 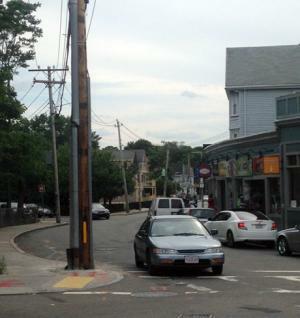 Eversource has received permission from the city to install a third pole between the pair on the strip in question, according to Durand, which would distribute the weight of the wires and cables among three poles instead of two. Meanwhile, he added, the utility company has planted “the widest wooden pole” it has available and is reaching out to pole manufacturers to help the company identify what caused the fiberglass one to break in the first place. “The city maintains the expectation that all companies that are conducting business in Boston do so without disruption to residents,” he said, “and with the understanding that public safety is of paramount importance.” Walsh added that residents should use the city’s 311 system to report concerns about any poles in the city.